Jeffrey Ullman is a professor of Computer Science at Stanford. He is famous for his book Introduction to Automata Theory, Languages, and Computation. He teaches the Automata course in Coursera, and I’ve just finished the most recent edition. Ullman’s research interests include database theory, data integration, data mining, and education using the information infrastructure. He was Sergey Brin’s PhD advisor and won the Knuth Prize in 2000 . We divide this post in two parts. In the first part, we’ll provide a brief overview of automata theory, including basic concepts and terminology. In Part 2, we’ll focus on the limitations of automatons by discussing undecidability. In the following sections, we’ll go from the more limited automata, to a push-down automata and then to a turing machine. We can think of a finite automaton as a state machine. It’s represented by a directed graph where the nodes represent states and each edge connecting two states has a label, which is a symbol from a given alphabet . Consider an initial state , a set of final states and a string of the alphabet . To be more generic, we can describe the edges of the graph as a transition function. It takes as input a state and a symbol and outputs a new state . We denote such function as , so we have . We can then decide if input is accepted by this automaton by simulating it on the automaton. That consists in consuming each character from at a time and moving from one state to another by following the edge labeled . If there’s no such edge, we can assume it goes to a dead-end state where it gets stuck and is rejected. If after consuming all the input it is in one of the final states, we say it’s accepted, otherwise it’s rejected. If there’s always at most one edge to take at any point of the simulation, we have a deterministic way to decide wheter is accepted, so we call such class of automaton, determinist finite automata or DFA for short. In case it has multiple choices, we have a non-deterministic finite automata, or NFA. Surprisingly, a DFA is as powerful as a NFA, because we can simulate a NFA with a DFA, though such DFA might have an exponential number of states. DFA’s are also as powerful as regular expressions, which is out of the scope of this post. We define a set of strings as a language. We say that an automaton defines a given language if it accepts all and only the strings contained in this language. In the case of finite automata, the class of languages that they define is called regular languages. A push-down automata is essentially a finite automata equipped with a stack. The symbols that can go into the stack are those from the input and also some additional ones. In this automaton, the transition function takes as input, the state , the input symbol and the element at the top of the stack . It outputs the new state and the new top of the stack that will replace the top , which can be more than one element or event the empty symbol, meaning that we didn’t put any element on top. This type of automaton can be shown to be equivalent to a context-free grammar (CFG), which is out of the scope of this post as well, but it’s very common for describing programming languages. The set of languages for which there is a push-down automata that define them, is called context-free languages, which contains the regular languages. What could we accomplish with a finite automaton with 2 stacks? Quite a bit. Such automata are called two-push down stack automata. It’s possible to show that a finite automaton with 2 stacks is equivalent to a Turing machine. So, what is exactly a Turing machine? It’s a device with an state, an infinite tape and a needle that points to a given position on this tape. The input is initially written on the tape and the needle points to the first character of . All the other positions in the tape contains the blank symbol. The transition function that takes as input the state and the input symbol pointed by the needle and it outputs the new state , the new symbol that will be written replacing and the direction that the needle moves after that (either right or left). In case there’s no defined transition function for a state and input symbol, we say that the machine halts. There are two main flavors of TM regarding when an input considered accepted: On options is that the TM has a set of final states and whenever we get to one of that states, we accept. The other option is by accepting when the TM halts. It’s possible to show that in the general case both versions are equivalent, in the sense that both define the same class of languages, which was historically denoted by recursive enumerable languages. An algorithm for a decision problem is a special type of TM that accepts by final state and it’s always guaranteed to halt (whether or not it accepts). The class of languages that are defined by algorithms are called recursive languages. We can simulate more general TMs using our definition of TM. For example, we can model a TM with multiple tracks. Instead of having a single element, each position on the tape can contain a tuple, where each element of the such tuple represents the element on each tape with the same position. We can even have multiple needles, by using a dedicated tape for representing the current position of each additional needle. In this second part of the post we’ll discuss about undecidability. A problem is said undecidable if there’s no algorithm to solve it, that is, no TM that is guaranteed to halt on all its inputs. Question: Are Turing machines powerful enough so that for any language there exists a corresponding TM that defines it? Not really. We will next define a language that creates a paradox if a TM exists for it. Before that, we first discuss how we can encode TM’s as strings so it can be used as input to other TM’s. Encoding Turing machines. Given a description of a Turing machine (the input, the transition functions), it’s possible to encode it as a binary string. Each possible Turing machine will have a distinct binary representation. We can then convert these strings to integer. Since two strings can be converted to the same integer because of leading zeroes (e.g. both 010 and 10 map to 2), we append a 1 before all the strings (e.g. now 1010 maps to 10 and 110 to 6). We can now order all Turing machines by their corresponding integer representation. Note that some integers might not be encodings of an actual TM, but for simplicity, we can assume it’s a TM that accepts the empty language. So we want to know whether there is a TM for . Suppose there is. Then we ask: does accepts itself? The self-referencing property is the origin Russell’s Paradox. It essentially defines a set that contains all elements (which can also be sets) that do not contain themselves. The paradox is that if contains itself, then there’s a set in that do contain itself, which is a contradiction. On the other hand, if it doesn’t contain itself, left out a set, which also contradicts the definition of . We can use the same analogy for TMs. If accepts itself, then it is accepting a TM that doesn’t comply with the constraints. If it does not, it left out the encoding of a TM that doesn’t accept itself. The only assumption we made so far is that there is such TM for language , so we can conclude this was a wrong assumption and thus is not a recursive enumerable language. Question: Is there an algorithm to tell whether a Turing Machine accepts a given input ? To answer this question, we’ll first define a special type of turing machine. The Universal Turing Machine (UTM) is a TM that takes as input a TM encoded as string and an input as a pair (M, ) and accepts it if and only if the corresponding TM accepts . We denote by the language of the UTM. 4. Simulate , by reading from Tape 1 the possible transitions given the state in Tape 3 and the input at Tape 2. 5. If the simulation of halts accepting the string w, then the UTM accepts . Proposition: is recursive enumerable, but not recursive. Proof: It’s recursive enumerable by definition, since it’s defined by a TM (in this case the UTM). So we need to show that the UTM is not guaranteed to always halt, that is,. Suppose there’s such an algorithm. Then we have an algorithm to decide whether a string is in . First we check if is a valid encoding of a TM. If it’s not, then we assume it represents a TM that defines an empty language, so obviously it doesn’t accept itself and thus should go into . Otherwise, we ask our hypothetical algorithm whether it accepts . If it does, then the TM corresponding to accepts itself and should not go into . On the other hand, if our algorithm doesn’t accept, it should go into . We just described an algorithm that defines , but in the previous section we proved that has no TM that defines it. This contradiction means that our assumption that an algorithm exists for is incorrect. This is equivalent to the halting problem, in which we want to know whether a program (a Turing machine) will halt for a given input or run forever. Question: What are other problems undecidable problems? We can show a problem is undecidable by reducing an already known undecidable problem to it. In particular, if we can show a particular problem can be used to simulate an universal Turing machine, we automatically prove it undecidable. We’ll now do this with a fairly simple problem to describe and that has no apparent connection to turing machines. The post correspondence problem (PCP) can be stated as follows. Given pairs of strings of the form , , the problem consists in finding a list of indexes such that concatenating the pairs in this order leads to the same string, that is, (note that an index can be used more than once in the solution). There’s a stricter version of this problem in which the first pair of the input must be the first pair in the solution, which we’ll refer to MPCP. This doesn’t make the problem harder because it’s possible to reduce it to the original PCP. It’s possible to simulate a TM by solving the MPCP so that there’s a solution to the MPCP if, and only if, the TM accepts an input . We provide the detailed reduction in the Appendix for the interested reader. This means that the if there exist an algorithm for PCP (and thus for MPCP), we have an algorithm for any TM, including the UTM, which is a contradiction, and thus we conclude that PCP is undecidable. So far this is the second course I finish on coursera (the other one I did was the Probabilistic Graphical Models). I’m very glad that classes from top tier universities are freely available on the web. Automata theory was one of the gaps in my computer science theory base, especially Turing machines. I’ve done an introductory course on theoretical computer science, but it was mostly focused on intractable problems and cryptography. Proposition. It’s possible to decide whether an universal turing machine accepts a string by reducing it to MPCP. Sketch of proof. We won’t give a formal proof of the reduction, but the idea is pretty neat and after understanding it, the reduction becomes more intuitive. First thing, let’s define a snapshot from a simulation of a TM. A snapshot is a compact description of the TM in a particular simulation step. We can represent it by placing the needle to the left of the tape position it points to. We can omit both the right and left infinite endpoints that are composed eintirely by blanks. Thus, the first snapshot is represented by . If we move the needle to the right writing to the current position and changing the state to , the snapshot becomes . If instead from the first snapshot we moved to the left, writing and changing the state to , we would have , where is the blank symbol and we need to represent it because it’s not part of the contiguous infinite blanks block anymore. And each incomplete solution of the MPCP, we have the first part one step behind the second part. With that, we can “tie” to snapshots together by a pair, which can be use to encode the transition function. The solution will have to start with pair (1), because it’s the first pair and we’re solving the MPCP. Note that the pairs of form (3) are only used to copy the remaining part of the tape. That’s because the transition function itself is local, in the sense that it doesn’t know about the tape values that are not involved its definition. This movement is analogous for the other transition functions. The remaining case is when the reach a final state, in which we want to accept my making the first part of the partial solution to catch up with the second part. Note that the final closing is carried over using several auxiliary snapshots that don’t actually correspond to the actual simulation, but it’s easy to obtain the right snapshots from a solution to the MPCP. Flood-it is a game created by LabPixies, which was recently aquired by Google. The game consists of a board with random colors cells. Let’s call the top-left cell a seed cell and the region connected to the seed cell and with the same color as it, the flooded region. At each round, the player chooses a color for the flooded region which may flood adjacent regions, expanding the flooded region. The final objective is to flood all the board. In the original game, there are three different sizes of boards: 14, 21 or 28. The number of colors is always 6. A paper from Clifford, Jalsenius, Montanaro and Sach , presents theoretical results regarding the general version of this problem, where the size of the board and the number of colors can be unbounded. In this post we’ll highlight the main results of their paper and present an integer linear programming approach to solve it exactly. For , the game is shown to be NP-hard even if one is allowed to start flooding from an arbitrary cell. The proof given in  is based on a reduction from the shortest common supersequence problem (SCS for short). 1. Pick the color that maximizes the number of cells covered. 2. The most frequent color in the perimeter of the current region. In Figure 2, we have an instance where this strategies can be arbitrarily bad . They use colors while the optimal solution is 3. Cycle through all colors until the board is colored. gives a solution with a value within a factor of the optimal value. More specifically, if is the optimal number of movements and the number of available colors, then this algorithm solves the problem with no more than movements. To see why, let be the color sequence of the optimal solution. In the worst case, each cycle covers at least one color in the sequence. Thus, this algorithm is approximated. This can be refined to observing that the cycle does not need to have the current color of the flooded region. The authors improve this bound with a randomized algorithm that achieves a expected factor. They also give a lower bound, proving that if the number of colors is arbitrary, no polynomial time approximated algorithm with a constant factor can exist unless P=NP. Theorem 1: There exists a polynomial time algorithm for Flood-It which can flood any n x n board with C colors in at most moves. 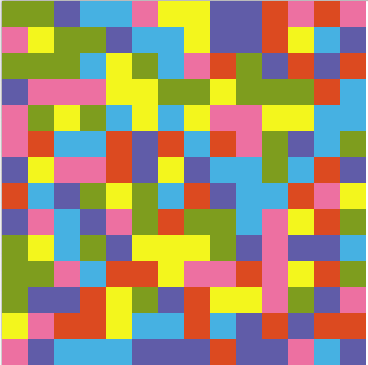 Theorem 2: For , there exists an board with (up to) colors which requires at least moves to flood. That is, we can’t expect an algorithm to perform much better than the one from Theorem 1 for arbitrary boards. Let be the number of colors and an upper bound for the optimal solution. 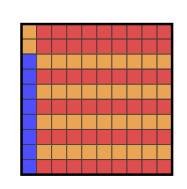 A component is a connected region of pixels with same color, considering 4-adjacency. Two components and are adjacenct if there exists at least a pixel in adjacent to a pixel in . We denote by the set of components adjacent to component . Let be the set of components and . Furthermore, let be the color of component . We define the binary variable that is 1 if color is chosen at iteration or 0 otherwise. We also define the binary variable that is 1 if component is filled in some iteration or 0 otherwise. For simplicity, we’ll assume that the component of the seed cell has index . Constraint (2) states that we fill a component exactly in one iteration. Constraint (3) says that at each iteration we pick at most one color. Constraint (4) allow us to fill a component only if any of its adjacent components has been already filled (which means it currently has the same color as the seed pixel) and if its color is the same as the chosen color (5) . Finally, constraints (6)-(9) state the variables are binary and each component starts unfilled except the component of the seed cell. We’ve implemented this model in C++ using the COIN-OR Cbc library. The code is available, as always, on github. The first task was obtaining “real” instances. I don’t know whether the colors of Flood it! boards are uniformly chosen. Thus, I preferred to take some print screens from the original game and do some image processing to convert it matrices with integer representing colors. Unfortunately the model is too big if we use as the number of components, . The number of constraints (4) is then and for the instance in Figure 3, . In order to reduce its size, we tried two tricks. We also need to change (2) equality to inequalities. Now, note that there are constraints (4′). The second trick is based on the assumption that in general, the optimal number of movements is much less than the number of components. Thus, solve the model for increasing values of starting with the number of colors until we find a feasible solution. Even with these changes, we were not able to solve the instance in Figure 3. The 5×5 instance obtained from the first rows and cols of the matrix is solved in 2 minutes using 9 colors. For the 6×6 instance obtained the same way, the solver does not find the optimal solution in an hour. In this post we gave a brief summary of Clifford et al. paper and then presented a integer linear programming approach to solve instances exactly. As our experimental results showed, even for the smallest boards (14 x 14) we’re not able to obtain optimal solutions in feasible time. As future work, we may try devising alternative models or find additional inequalities. Another possibility is to solve this same model using a commercial solver like CPLEX.